During the Centennial Summer of 2016, I started to give a lot of thought to our humble beginnings. While we’ve all been part of Takodah’s journey of growth along the shores of Cass Pond, the fact remains that our earliest days were spent in two other places. It became a mission of mine to figure out exactly where those sites were located and to determine how they influenced where we are today. It took a year of digging through our archives, reading page after dusty page of old documents, searching the internet, talking to knowledgeable alumni, and cold calling leads that I thought could help to plug the gaps in our patchwork of history. While some of what I learned is common knowledge, it’s the little details and discoveries that I think you’ll enjoy. And, as it turns out, recurring names is good luck for our Y. 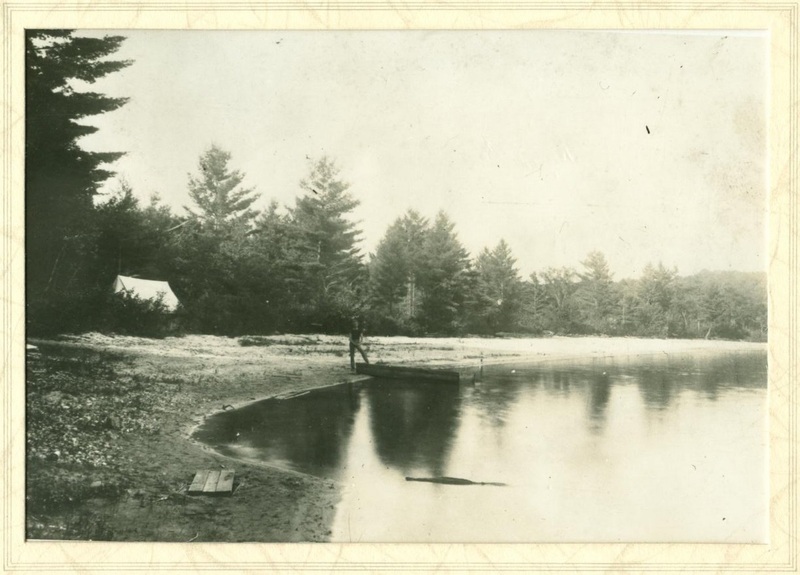 We begin with our first camp which was on Swanzey Lake in 1914. The earliest records, including some that were hand written from the site by Howard himself, do not give precise directions other than “a three-and-a-half mile walk from West Swanzey Train Station, along a dirt road, ending on the top of a small hill by the lake.” Having traced those steps as best I could and after doing a fair bit of research, we have confirmed that Dr. Bourne’s property, at the head of the lake, later became Camp Wawona and then Pilgrim Pines and Camp Squanto on West Shore Road. We took it one step further by visiting the site this summer and, even though we knew that the hurricane of 1938 would have changed the tree lines, we were able to match a few key landscape features using original photographs we have of the 1914 encampment. In that moment we knew we had found it. We left Swanzey Lake feeling that we had accomplished the first part of a two-part mission. 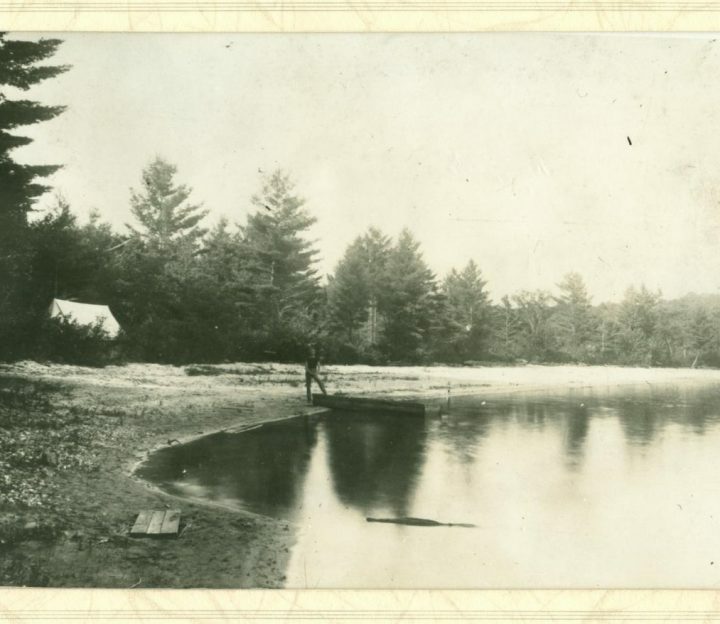 And so, we moved on to our second encampment which was on Tolman Pond in 1916. 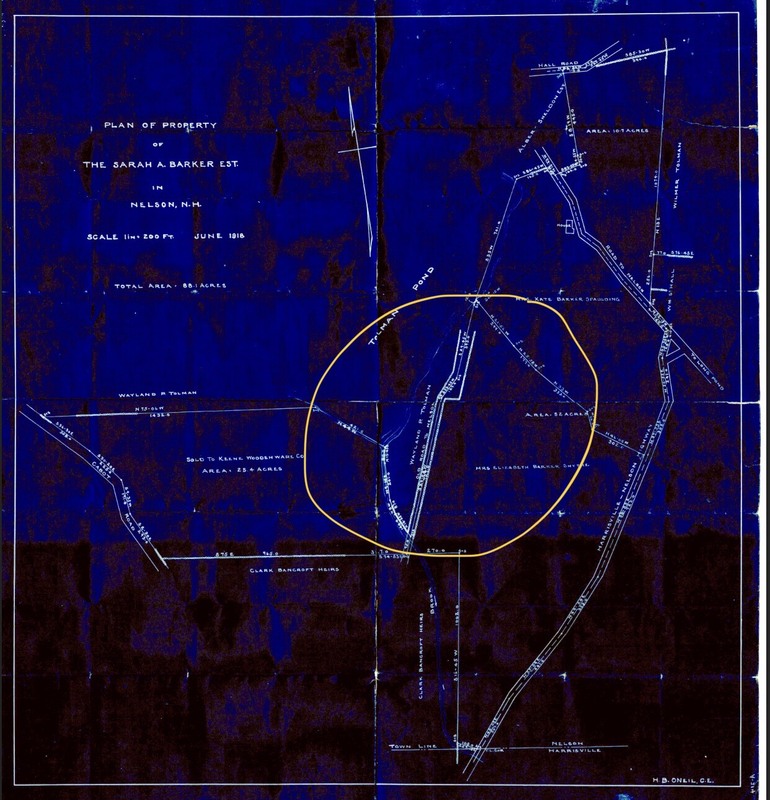 This was the site in which the name “Camp Takodah” would first be used and it would prove to be the most challenging site to locate. Ultimately, it would also be the most rewarding to explore. The search began the same way: research, research, research. Our second county secretary, Daniel E. Lorentz, left similar records as his predecessor. They were short, simple, and sparse. As for the camp, they lacked any concrete evidence of the location beyond the name of the pond itself. 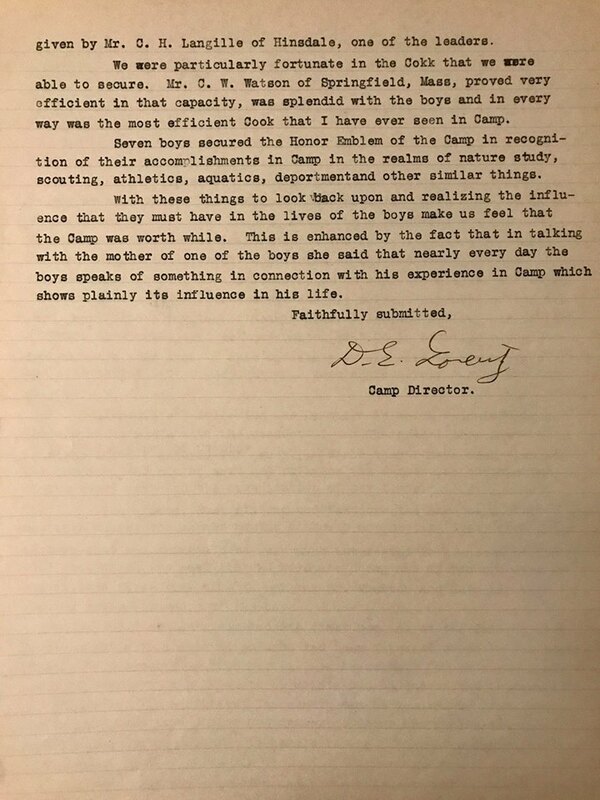 Even Daniel’s 1916 summer report, which goes into fascinating detail about the activities at the session, didn’t say exactly where it was. 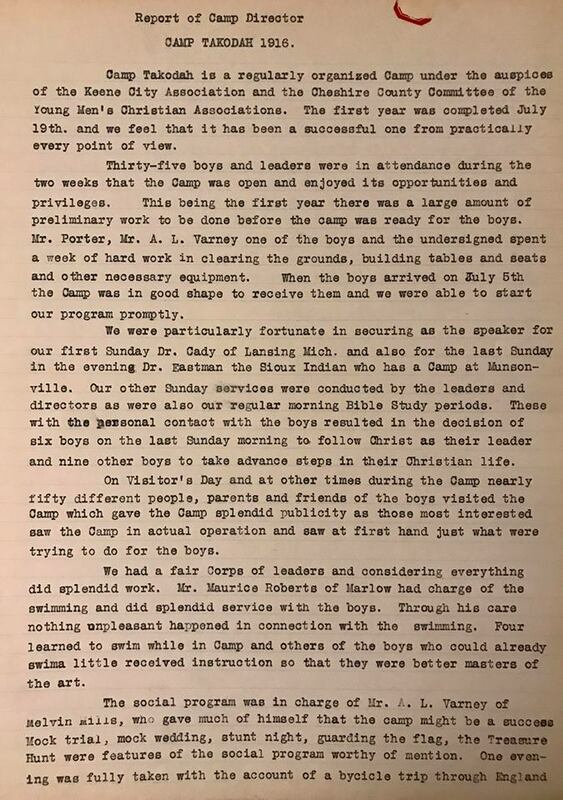 However, his report, along with some other County Y reports from that year, gave us some clues about the geography of the site and how it was used. 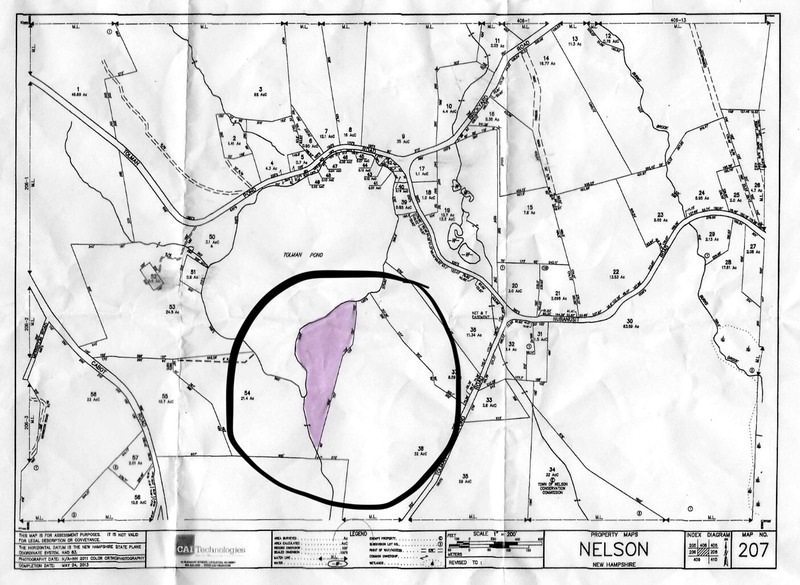 I took gathered up that information and contacted the town of Nelson where Tolman Pond is located. I soon came across a local historian whose name alone told me that I was unquestionably on the right track. Her name? Karen Tolman. When I first spoke with Karen on the phone, she recognized our organization and told me she had heard that there was a camp on the site a long time ago. Barry Tolman, Karen’s husband, and his family have lived on the pond and in the Nelson, NH area since the late 1700s. Barry and Karen still live at the water’s edge and they immediately had an idea as to where our Camp was located. The site was directly across the pond from their house. With a renewed sense of excitement, I made arrangements to go and meet with them. On October 7th, I visited the Tolmans, along with my two sons and Bill Parkman, the 28th President of the Takodah YMCA Board of Directors. After looking over a map of Tolman Pond from 1918, a property “tax map” from 2016, and based on the clearings, paths, water levels, swimming depth, history, property ownership, and our reports from 1916, the Tolmans concluded, beyond a shadow of a doubt, that there was only one place on the pond that YMCA Camp Takodah could have possibly been located: Picnic Point. The original road on the “far side” of the pond is long gone (the ’38 hurricane caused substantial changes in Nelson as it did in Richmond) but the original walking path that followed an outlet stream to Picnic Point was easily located. We believe, based on descriptions in the records, the path we found is where D.E. Lorentz and his boys walked in from the nearby road. But, nowadays, the easiest way to access the point is to canoe across the pond form the Tolmans boat house. And that is exactly what we did. As you can see, the point has been overgrown in the past 101 years but the layout of the land instantly made sense to us as being appropriate for use as a camping site. It has flat areas that would have been suitable for tents and tables at the time. It has the only location on the pond where the water is deep enough for swimming. It has a large rock in the water that we could imagine being used for “stunt night” (one of D.E. Lorentz’s Evening Programs) as a platform for jumps, dives, and flips into the water. It had fire pits. It had privacy. It had a view. It had it all. It also showed us how such a relatively limited, isolated site and a very small pond would act like a stepping stone to what we would eventually have on a much greater scale in Richmond. The same goes for Swanzey Lake. They were nice areas, to be sure, but they were not big enough to support the rapid growth that our founders had in mind as they looked to the future of our Y. 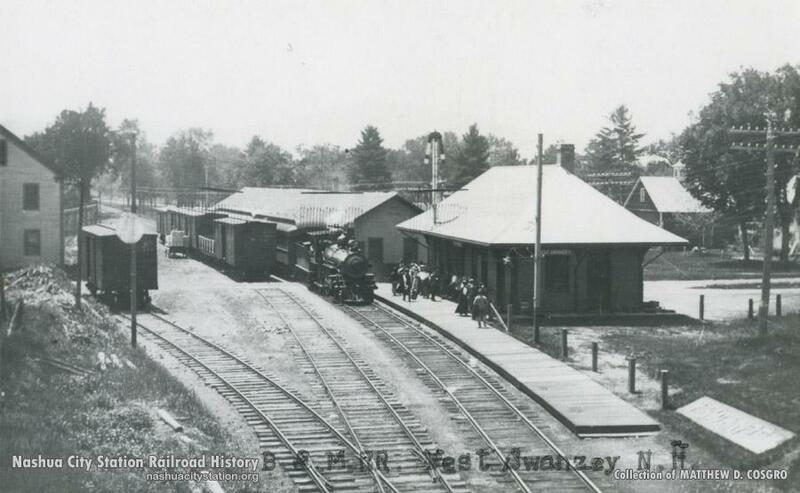 A move to our permanent property in 1919 was inevitable. On a personal note, I can tell you that it was incredibly exciting to walk in the footsteps of the pioneering Takodians. It’s also an honor to confirm that we finally know for certain the precise location of both of our pre-Richmond encampments. Knowing the names was great, but seeing them for ourselves was amazing. I highly recommend that you visit both sites and see where it all began. While you’re there, don’t hesitate to dip your hands into the water or run some dirt through your fingers to feel what the campers felt so many years ago.